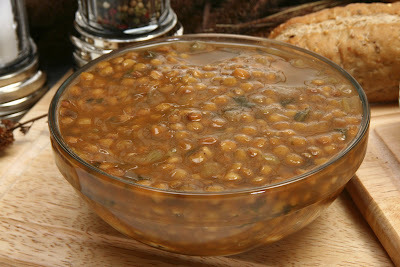 Linda LaRue Blog: Only 130 Calorie 5 Winter Vegetable Lentil Soup! It's a cold, rainy day in LA. I'm off to the Sunday farmer's market to buy some vegetables to make my 5 Winter Vegetable Lentil Soup, which is part of my SOUPer Slim Diet ebook at www.LindaLaRue.com/store.html. It's yummy, hearty, and filling on a cold, winter day, and it's just 130 Calories per cup with 12 grams of protein and 6 grams of fiber.